Some people are surprised by the pick, I was caught off guard briefly, but the Cubs taking Kris Bryant wasn’t as shocking as it might have seemed on the surface. The Cubs front office didn’t bow to the pressure of Appel/Gray have to go 1-2, they trusted their scouting and had Appel number one, and Bryant number two, and I love the fact that they went with who they wanted, and not who everyone thought should be picked there. With that said, let’s get to know Kris Bryant shall we? POWER, it’s not easy to find in the draft, and I’m talking big, major league ready power, that’s what Bryant has. 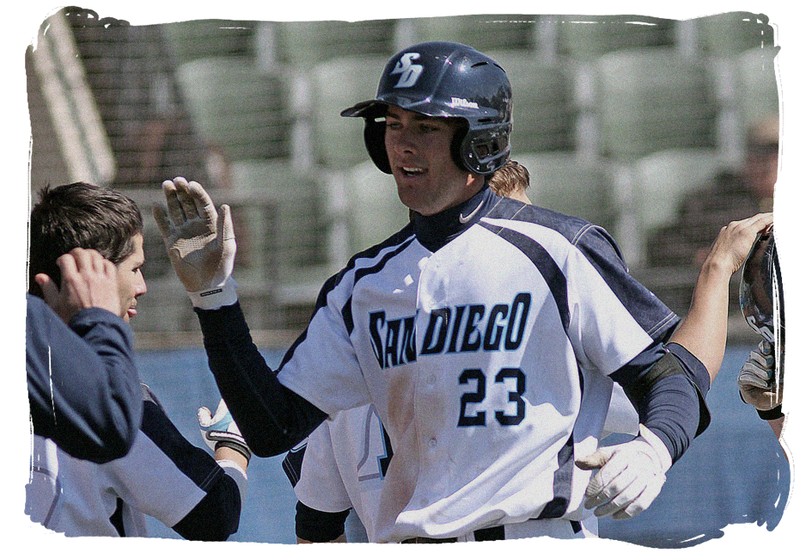 Bryant hit thirty-one home runs in just 228 at bats with the University of San Diego this year, yikes. What I like the most about him is his ability to get better, and adjust to things on the fly, which is not easy to do. As a Freshman, Bryant hit nine homers, as a Sophomore he hit fourteen, then came thirty-one this year. He has raw power but his adjustment in his approach at the plate is what led to more home runs. Bryant walked 66 times, and struck out 44 times in 228 at bats, what was the change at the plate? His stance changed, he went with a wider base, and simplified his approach as well, he was able to take pitches and hit them where they were pitched, using the whole field with power. Power is Bryant’s main weapon, but he has other tools as well, one of them is an above-average arm which comes in handy at third base. Some scouts have said that Bryant profiles better as a right fielder as he has shown the ability to play there with that arm, and bat. However the Cubs have been clear that Bryant will play third base for the foreseeable future, that’s the right move in my opinion as that is a glaring hole in the system. I’m excited to see Bryant signed and where he might start his Cubs professional career. Usually the thought is to start these picks out at Boise, but given his skill set already don’t be surprised if he joins the prospect laden lineup at Kane County. Congrats Kris! Welcome to the Cubs. There will come a time soon enough where the Cubs are not picking at the top of the draft, this year is not that time as the Cubs pick number two overall. Picking that high obviously means you suffered through the previous year, but it also means that you should get an impact player and that’s exactly what the Cubs are out to get. This is an exciting time, not just because of the high pick, but because the Cubs are going to add forty some odd young men to their organization, but let’s focus on what they might do with their first pick. Over the last few weeks we have read quotes, and stories about what the Cubs might do with the number two pick, ultimately only the Cubs really know, but much like last year I think it has a lot to do with what the Astros do with the number one pick. Now last year the Cubs were picking sixth, but I thought that whole draft changed when the Astros went with Carlos Correa at number one as that was a player that many people thought might be on the Cubs radar at six, he went one. After the draft the Cubs were steadfast in their response, “Almora was the guy no matter what, we would have taken him number one.” I like hearing that, the draft should be more about evaluating talent than reacting to what other teams are doing, sure you want to take the best available that high in the draft, but your best available might not be another teams best available. The general consensus is that the Cubs have narrowed their choice down to four guys, let’s take a look at who the Cubs are looking at as well as my predictions. The Cubs want him, that’s my honest opinion, I think if the Cubs had the number one pick in the draft they would take Appel. Funny thing is, the Cubs had a shot at Appel in last years draft, but Appel slipped, he was once thought of as the number one overall pick last year until his bonus demands scared a number of teams off. Appel eventually went eighth to the Pirates but could not come to terms on a contract so returned to Stanford for his senior season, and here we are again with Appel atop the draft rankings. It’s easy to see why the Cubs like him, he has a plus fastball, and three above average pitches that he can throw for strikes, and projects as a top of the rotation guy. I don’t like saying can’t miss with a pitcher because of arm injuries that are just one pitch away, but he’s as can’t miss as they come. Prediction – Houston doesn’t pass on him twice and takes him at number one overall. Cubs Chances – Fair, there is no clear-cut number one, and I think if the Astros don’t grab Appel then the Cubs will. You know, the Cubs need power arms, well here’s a power arm, and then some. Gray has a plus plus fastball which has been clocked at triple digits, not just at the start of games, but late in games. He might not be as polished as Appel, but he has two plus pitches and has a chance to keep developing that change-up into a plus pitch as well. Now the positive adderall test, this has put a seed of doubt into some people’s minds, I wouldn’t say that I am one of them. I don’t think the Cubs are either, if the Cubs want an arm at number two and their best available (Apple, in my opinion) is off the board then they go with Gray. Prediction – Gray is still on the board at two and the Cubs take him. Cubs Chances – Great, I think he will be on the board still, and it comes down to if the Cubs think Gray is the best available. Yes I know that I have a Cubs logo with Bryant as well, here’s why. This front office is very particular with their high first round picks, they prefer bats, specifically college bats. 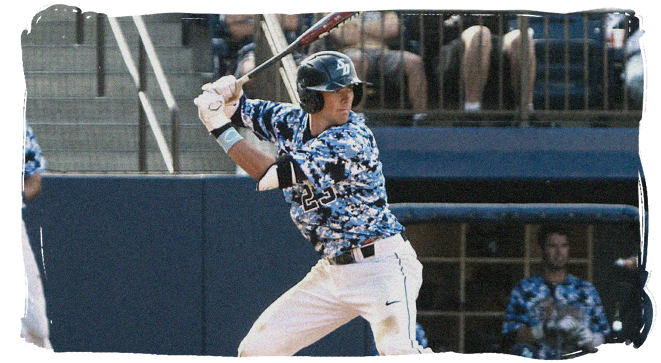 Kris Bryant has rocketed up the draft charts because of his tremendous Junior season at the University of San Diego. Third base is a challenge for the Cubs, not just at the MLB level but at the minor league level as well. Josh Vitters is the cream of the crop in the organization with whispers about Javier Baez being moved there. If the Cubs want to grab a power bat at the hot corner this would be their chance. The only thing that would pull the Cubs away from Bryant would be his swing and miss potential, but some say his power makes up for that. Prediction – Assuming the Astros don’t take Bryant at number one, which they could, then I think Bryant lands with Colorado. A word of caution however, if the Astros take Appel the Cubs front office might choose to follow what they have in the past and favor hitting over pitching. All depends on who they Cubs feel is the best available, I don’t think they take Bryant just because he’s a third baseman. Cubs Chances – Excellent, odds are Bryant will be there, the Cubs would just have to pull the trigger. This is where things get interesting in my opinion, here’s why. Moran profiles as the “Cubs Way” guy, meaning he is a better overall hitter than Bryant, but odds are he won’t reach the power potential that Bryant will. However, Moran will have professional at bats, do the Cubs trust their scouting and philosophy to take the guy that fits the mold the most? I’m leaning towards no on that one just because I feel that if they are going to take the best available in their eyes, and they will, that will not be Moran. Another wrinkle is that Moran is a left-handed hitting third baseman, I already talked about the need at third base, but the need for a solid left-handed hitting third baseman is almost enough to make a team jump, just don’t think the Cubs will. 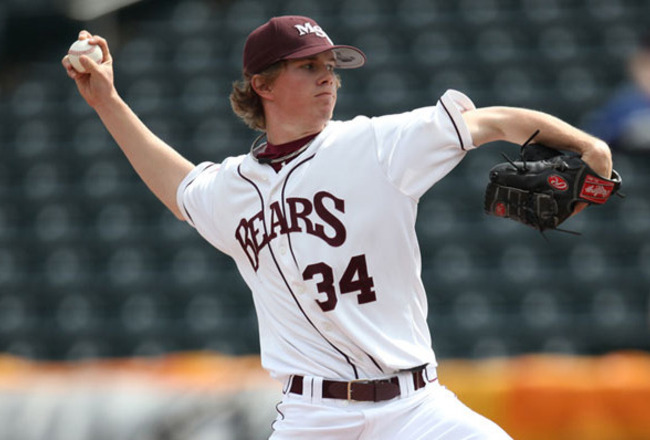 Prediction – The Cubs won’t take Moran, and he will go to the Indians at five after Appel, Bryant, and Gray are off the board and the Twins go with Kohl Stewart or Braden Shipley at number four. Cubs Chances – Great, I don’t think there is any chance the Astros take Moran, if they go bat with the number one pick they will take Bryant, meaning Moran will be there, but so will Gray and Appel, that’s too much to pass up on to take Moran. In conclusion, there are four viable options for the Cubs to think about, but it all comes down to who the Astros go with. If the Astros take Appel I think the Cubs will go with Gray. If the Astros take Gray I think the Cubs will go with Appel. If the Astros surprise for the second year in a row and take Bryant then the Cubs take Appel. Bottom line, I don’t think the Cubs pass on one of the college arms that are guaranteed to be there. Now, if the Cubs feel strongly about their scouting and talent evaluation they could pass on Gray and Appel at number two and take the bat given the chance to take a number of quality arms in the second, third, and fourth rounds because they will be there. 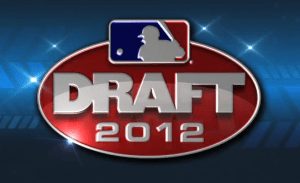 The draft begins on June 6th and runs through June 8th, live coverage begins on MLB Network at 5:00 PM CST with an hour-long preview show with the first round scheduled to start at 6:00 PM CST. The first 73 picks will be aired on MLB Network and streamed on MLB.com, that’s the first round, and the supplemental round. Rounds three through ten will be streamed live on MLB.com on June 7th beginning at 11:30 AM CST, and rounds eleven through forty will be streamed live on MLB.com on June 8th beginning at noon CST. Because of the new collective bargaining agreement teams have to pay attention to how much they can spend over the first ten rounds in the draft. If you want a full rundown on how the bonus pool works I suggest you take a gander at Carrie Muskat’s article about the draft, she does a fine job of breaking it down. 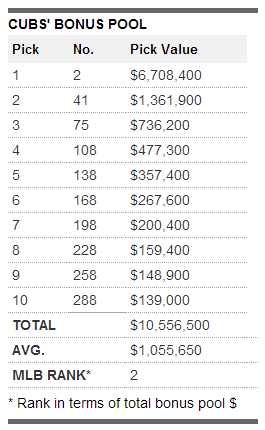 Bottom line, the Cubs have the second most money to spend on their top ten rounds, that’s nice. I hope you enjoyed reading about the Cubs options with the number two pick, and don’t forget to join me for the first round tomorrow as I will be live blogging the first round just like last year. Can’t wait! Of course the draft would get more interesting just three days before its set to begin. My draft preview is coming up but this news has to be shared. The prevailing thought is the Cubs could be deciding between Mark Appel and Jonathan Gray, so the news today of Gray testing positive for an MLB banned substance could alter the Cubs choice. The substance? Adderall. Commonly used to treat AD/HD, it is also a stimulant, which is why it appears on the banned list. Some people need it, so Major League baseball allows the use of adderall with a prescription, something Gray doesn’t have. So this calls into question character issues possibly, something the Cubs pay very close attention to, but I caution everyone reading this, let’s get ALL the details first. If it comes out that he is using it as a recreational drug then sure you can question his choices, but by no means is this a black mark on his yet to begin career. It is horrible timing for Gray however as the discussion surrounding him and the draft will now include the positive test and not just how promising his career could be, and what a memorable night the draft will be, but I suppose he brought this on himself. In my opinion if Gray is the guy the Cubs want and he is there at two the Cubs still take him, I don’t think they are, but it is something else to think about. With how bad the Cubs have been all year and the promise of a bright future, yesterday was like Christmas morning. Well, I guess it was more like what we might get on Christmas morning 3-5 years from now. Still an exciting day for fans as right now it’s one of the few things we can get excited about. 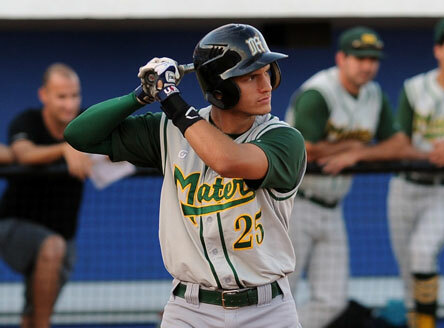 The draft kicked off with a surprise as Carlos Correa was selected number one overall by the Houston Astros. In fact the guy most, if not everyone thought was going number one, Mark Appel, didn’t get selected until number eight by the Pirates. The concern with Appel is his sign-ablity because he is represented by Boras. Before the draft started if you would have told me that the Cubs would have a shot at Appel at number six I would have thought you were crazy, but there he was. The Cubs however went a different direction, and I think the correct one. I love the pick, the kid is pure character not to mention an elite talent in the outfield. Scouting Report from Baseball America..
Albert Almora combines a high school player’s upside with the polish of a college hitter. He’s headed to Chicago after the Cubs selected him sixth overall. Almora has tools, game instincts and makeup; his lone weakness is his fringe-average speed, which some scouts describe as below-average. Scouts give him 60s across the board otherwise, with some giving him higher grades for his arm strength. His instincts allow him to play center field at a high level; one scout said he was a 40 runner with 80 range and said he played center field like some players do shortstop, being instinctual rather than reactive like almost all outfielders. Almora has played for team USA six times already, he’s only 18. I’m very excited to see this kid progress through the system. Johnson was moving quickly up Draft boards, but a forearm strain put that on pause. He came back and threw well, with plenty of time to show everyone he’s fully healthy leading up to the Draft. Johnson has a good three-pitch mix starting with a fastball that is plus at times, touching 94 mph. He’s more successful when he keeps it down in the zone, which he does when he repeats his delivery well. Johnson throws a hard curve that works as an effective out pitch, missing more bats than he does with the fastball. He doesn’t use the changeup as much, but it has the potential to be at least an average pitch in the future. 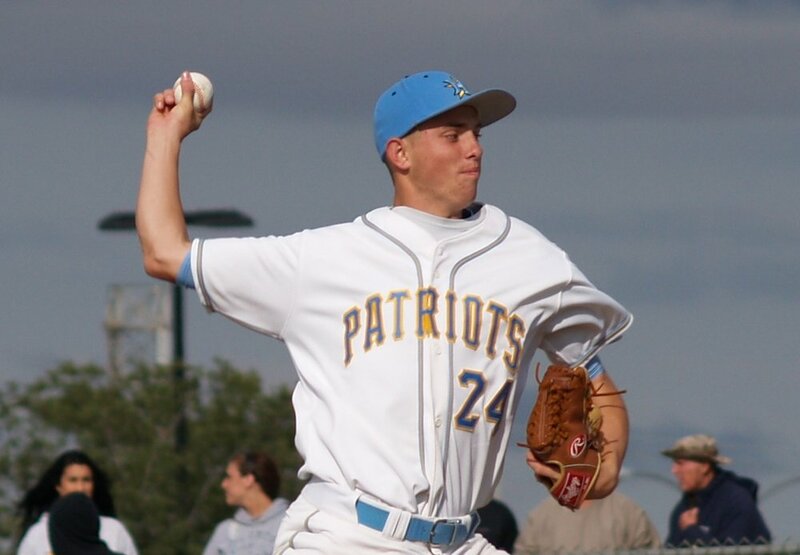 He throws strikes and competes very well on the mound. Assuming he’s healthy, Johnson should join a solid group of college starters who could go off the board shortly after the top tier, profiling well as a No. 3-type starter at the highest level. The Cubs got a quite a bit of value with the 43rd pick overall, and it could turn out to be a great pick if Johnson proves to be healthy. After a big performance at last summer’s Area Code Games, Blackburn has continued pitching well this spring to keep him firmly on the prospect map. The NoCal high schooler has a good fastball that hits 92 mph consistently and will touch a tick or two higher on the radar gun at times. His two secondary offerings – a curve and a changeup – both have the chance to be very effective pitches. He’s generally around the strike zone and thanks to his athleticism and sound delivery, his command should only improve with experience. The Arizona State recruit has some projectability, meaning his already pretty good stuff has room to get even better. That should get him off the board early enough to keep him from heading to Arizona. Good command and a ton of room to get better, sounds good to me. The Cubs will be hoping that they grabbed Blackburn early enough to break his commitment to Arizona. Round two starts today at 11 AM CST, get ready for more draft coverage as new names will start pouring in very soon. I started talking about the draft a few weeks ago, and how much prep time Theo and company were putting into it, well now we are close enough to the draft so you should get to know who the Cubs have been looking at. 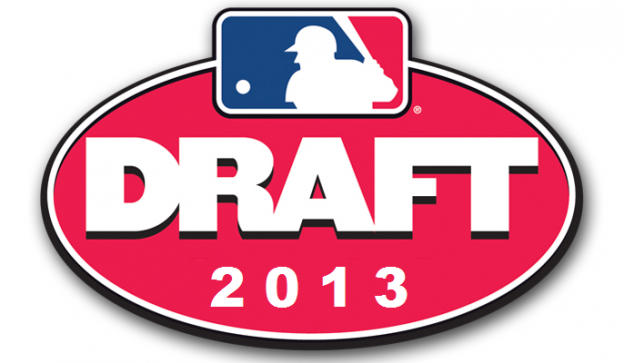 The draft will be broadcast live on MLB Network at 7:00 PM EST, one hour earlier MLB Network will air a draft preview special. Want to know who they will be talking about, and who the Cubs are thinking about taking at number six? Then keep reading.